our Diego: top of Italy, Europe and world ?! 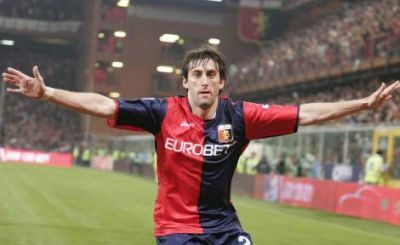 Diego Milito scored 57 goals in 90 matches with Genoa before he moved to Inter last summer. This season Diego scored 22 times in Serie A including the deciding goal in Siena last Sunday that brought Inter the 18th scudetto. Diego also scored the only goal with Inter against A.S. Roma in the Italian Cup-final 2 weeks ago. And tonight in the Champions League final ? so we support Inter because of Diego and Thiago Motta who also left Genoa to Inter last summer, but he is squalified after his red card in Camp Nou in the semi-finals against Barcelona. 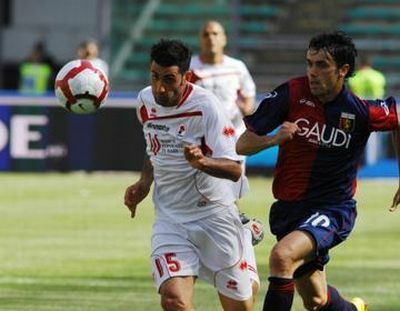 A victory of Inter also means 1 extra Italian team in Europe in the season 2011-2012, which can be very usefull to our Genoa ! After the victory against Milan the misson was already accomplished, but Genoa also wanted to stay at the 8th position in the standings to be qualified to the 1/8 finals of the Coppa Italia and avoid playing at Ferragosto (15th August) in the 3rd round of the Italian cup. On the other hand: our topscorer Rodrigo Palacio (7 goals) already got permission to return in Argentina and Mr. Gasperini did not protest against his squalification of 2 matches instead of the usual 1 match. The match was decided in 3 minutes. In the 18th minute Robert Acquafresca could not beat goalkeeper Campagnolo at their eye to eye confrontation, 1 minute later Ivan Juric got his second yellow card and had to leave to pitch, while again 1 minute later Maxi Lopez scored the only goal. Because Parma beat Livorno by 4-1 the yellowblue ended 8th in the standings and we are nineth. Sometimes you need your friends to realize your wishes. Because Genoa-fan Claudio Spagnolo was killed by Milan-hooligans in 1995 it is every year very difficult to buy a ticket to this match. Mostly only Genoa seasonticket-holders are welcome in the stadium, but this year also Genoani living in Liguria and officialy registered Milan-fans. Because Milan and their fans never said sorry since 1995 the Genoa-fans wanted to block the visitors-sector of Luigi Ferraris stadium. Because of this the authorities decided Saturdaynight at 23.00 (16 hours before the match) that Genoa-Milan is forbidden to all fans: 25.500 Genoani and 371 Milanisti. I doubted should I enter the stadium with my press-card or should I stay outside together with the 600 Genoa-fans that protested against this crazy decision of the authorities? Because all of these fans wanted only 1 thing: watching the match, I decided to enter the press-sector of the stadium to do what everybody wanted: be present to see Genoa beating the stars of A.C. Milan. And I was lucky, but from the first till the last minute I felt sorry to the fans outside that bought a (season)ticket and should be inside the stadium, just like me! The only positive effect of an empty stadium (while professional football in my opinion always should be played with an audiance) is that you can hear the players and the referee in the field. The game also is more fair, because the public doesn’t influence the match and the referee. To be honest Milan was the best team in the first half and we were lucky that the score was still 0-0 at halftime. 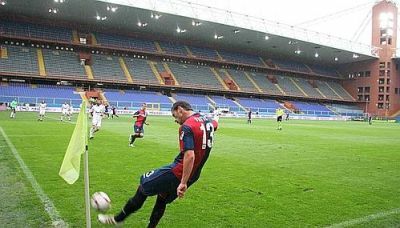 In the second half Rodrigo Palacio and Mimmo Criscito took the lead in the field, which brought Genoa the openinggoal by Giuseppe Sculli who headed a corner of Fatic behind goalkeeper Dida: 1-0. After the goal Milan tried everything to score the equalizer, but both Borriello and Huntelaar missed great chances. The most close to another goal was our Robert Acquafresca who shot the ball from outside the penaltyarea against the crossbar. Immediately after the last whistle of the referee all the players of Genoa ran outside to stadium to celebrate the victory with the fans that were still protesting and singing Genoa-songs. They deserved it! With this victory Genoa still is on the 8th position in the standings, 2 points ahead of Parma and 4 of Fiorentina and Bari. The mission of this season: ending at the left side of the standings is now 1 match before the end officially accomplished. Grazie ragazzi! Genoa missed 8 line-up players against Bari: 3 defenders (Bocchetti, Dainelli and Moretti), 2 midfieldplayers (Rossi and Kharja) and 3 strikers (Jankovic, Palacio and Suazo). On the bench Mr. Gasperini was like a father with Amelia, Fatic and 5 youthplayers. In the 1st half Bari was the best team in the field but the Pugliesi missed serveral chances: 0-0 at halftime. In the 12th minute of the second half our rented player to Bari: Meggiorini scored the opening goal: 1-0. Mr. Gasperini thought Meggiorini made a foul before he scored and protested heavily which costed him a red card and 2 matches squalification. After the goal of course Genoa tried to score the equalizer and assistent-coach Bruneo Caneo substited Zapater, Sculli and Palladino by the youngsters: Cofie, Boakye and El Shaarawi. This all did not help and in the last 5 minutes Bari scored 2-0 and 3-0 which was too much. Because also all our concurrents lost we are still on the 8th position in the standings, but the European dream is definitively over.